In the remote villages of the Masaka district in rural Uganda, we find children and families torn apart by HIV/AIDS, malaria, and poverty… To raise the economic level of these communities, we provide opportunities for education and enterprise development…Your passion and involvement together with their…Hands can create a better world. Into Your Hands-Africa unlocks the potential of youth and families in rural Uganda through education and enterprise development . Into Your Hands-Africa seeks to develop, educate, and inspire youth and families in rural Uganda through . In turn, they become self-directed, resourceful, and productive members of their rural communities. As models of integrity, they embody the spirit of twekembe and work together to determine their own futures. 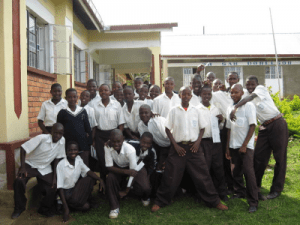 The primary goal of Into Your Hands-Africa is to give rural Ugandan youth and their families the opportunity to develop the knowledge, attitudes, and skills necessary to fully realize their potential through formal and informal educational opportunities. By unlocking their potential, they will become resourceful and productive members of their rural communities. Into Your Hands-Africa believes in the innate dignity, potential, and sacredness of all people and honors their right to strive for a full and dignified life for themselves through the work of their own hands. In addition, Into Your Hands-Africa embraces the community spirit of twekembe – “Let us work together to help each other.” Out of this love and respect for each other, Into Your Hands-Africa embodies the following values: Honesty, Accountability, Knowledge, and Self-determination. Through our motto, “Patience, Persistence, and Optimism,” we accomplish our goals. We are a socially responsible organization motivated by charity, hope, and compassion. We extend our hands in service to make life better for the most vulnerable. We espouse the principles of social justice and believe in the innate potential, dignity, and sacredness of each person regardless of religious beliefs, gender, race, sexual preference, or social background.